Pitmuck, Trammel, Chesapeake (PaxLair Times) – September 6, 2012 – by Ashlynn – A little late (there were a few extensions to the last catch) but the new call for fish finally in! There is also a slight change to the formate with the contest running every two weeks, tuesday to tuesday, to give people more time to fish. There was however no winner of the last catch. This is because Icky cut up all the fish to make into pies and forgot to count them. Oops! This (two) week’s catch is Holy Mackerel and whoever turns in the largest catch of fish will receive a prize of 200,000 gold coins! The deadline for the catch is midnight, Tuesday 18th September. 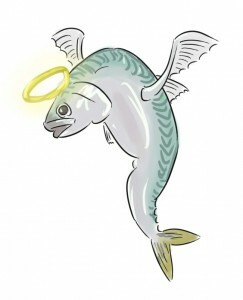 It should be noted that Holy Mackerel can only be found in the waters of Gravewater Lake in Malas. Fish should be turned in to the Deli house (the residence of Lucy and Icky Rotblossom) located on Pitmuck Island (refer to the atlas for the precise location of the deli – it’s not hard to find!). A book should be left identifying whomever brought the batch of fish. This entry was posted in Fishing, Pitmuck, Player Event, Player Quest. Bookmark the permalink.